Cleaning out the closet is always the hardest feat for me to tackle, you see, I am a collector of clothes. I enjoy hoarding clothes. If you know me, you will often hear me say that, "clothes are my thing." Indeed they are, but sometimes you just need to part ways with those "oldies but goodies". 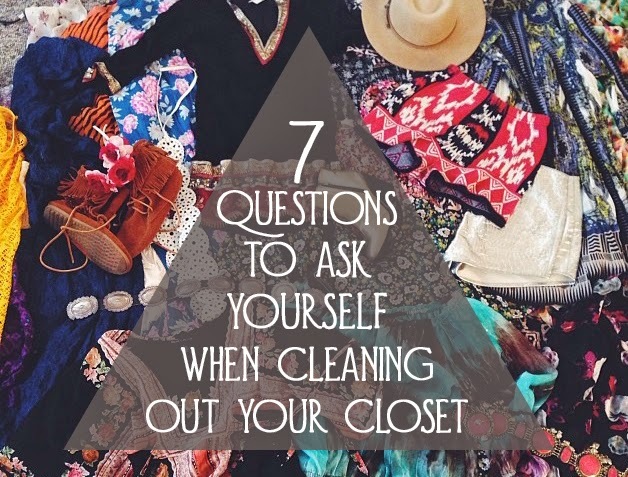 Spring time brings about a new time in your life-a time to shed your old skin and what better way to do that than by cleaning out your closet? 1 >> Does it fit? No? Toss it. 3 >> Is it likely that I'll wear this again? Eeee probably not, don't really know what I was thinking to begin with. 4 >> Is it damaged? But here's the true question: will you actually repair it? Sewing is not my forte. 5 >> It is in style? Carry over season attire? My best/worst question because if you love clothes you'll find a way to rationalize it. But DON'T! 6 >> If I was shopping right now, would I buy this? Uhhh more like what was I thinking when I bought this. 7 >> Do I feel confident when I wear this? You want to build an arsenal of apparel that represents you as an individual; you don't have time to keep deal with clothes that do not make you feel like the strong, free spirit that you are. It is time to break up with that stiff conservative attire and step into what makes you feel like you. And don't feel bad when you look down at your bedroom floor and there is a pile of clothes taller than you. What you do with all of this is solely up to you, but I would suggest taking it to an area donation center. Don't use this time as mourning; use this time to pass your treasures on to someone who needs them and will be extremely grateful for them. It’s a win/win situation because now you have room in your closet to actually see what you have + you just clothed a stranger giving them the confidence and strength you once felt in your old threads. These random simple acts of kindness are what make the world go around. Scale down and pass it along.